Developing a powerful B2B Value Proposition will differentiate your company from your competition. If you are having trouble differentiating your business from your competitors, then please read this story. It will show you how I differentiated a basic commodity business from my competitors, to become a sole provider to a major Canadian Bank. From 1980 until 1994 (Yes I am that old!) I started, owned and grew an IT (Information Technology) staffing business. I started the business from scratch. Although I had about 2½ years of experience with another agency, before I started my own business. It is interesting to note that I call staffing a commodity business, because it obviously dealt with placing the right “people” into an account to do a special job. And especially IT, where IT is a very specialized skill, such as programming, project management, etc. And of course, we should never think of people as simply a commodity, but unfortunately, that is how most clients saw this business. There are many reasons for this. One big reason is that different staffing agencies would submit the same person for a contract, and of course all at different rates. So, the person, in essence, became a commodity. I won’t get into why this happened, but that was the case back then. It just shows how lazy some people can be about the basics of any business, such as qualification. And the way people qualify hasn’t changed much since then. Many sales people don’t even qualify at all. Anyway, I had been trying for about three years to have this Bank (there are only 5 big Banks in Canada) use my company as their agency. In fact, they were not using any agency, but using a lot of individual independents, all on separate contracts. The value proposition I presented to them was this. I showed them what kind of money they could save by using an agency to do this type of work for them. Now every company wants to save money, you would think. But Canada’s big banks are huge monoliths that make billions of dollars a year in profits – not just billions of dollars in revenue, but billions of dollars in after tax profits. So saving them a few thousand dollars, or even a few million dollars, here or there, didn’t seem at first like a real Value Proposition. Besides, it wasn’t just saving them money, I was also going to save them valuable time, and give them more productivity from their contractors. I found out that it took three months to get any new employee or contractor to get up to speed on how the IT department of that Bank worked. So, in essence, any new employee’s, or contractor’s first three months, were wasted productivity time for the Bank. As you can imagine, any large company, especially a large Bank, has a huge IT department. In the 80’s most Canadian Bank’s IT departments had anywhere from 500 to 1,500 people working in IT. And about 10% of these people were contractors. And, as with any large company, and especially Canadian banks, many times the left hand didn’t know what the right hand was doing. This meant that after a project was finished, it usually meant that any contractors, on that just finished project, were let go. So, all of the knowledge gained from that project, but more importantly, all knowledge of how the Bank worked, was lost, only to have needless training again, for another new contractor for another project. Another three months of non-productive time. So, instead of losing these people, I suggested this option. If they turned those independents over to my company, I would do a number of things for them. 1. They would only have to pay one invoice on all of their contractors. It eventually went to 75 people for my company. This of course saved each IT manager a lot of headaches, and time. 2. Plus it took all responsibility off them, in case our Federal Government wanted to find out if these people were really contractors or employees. This was an audit the Banks did not want. 3. I would put in a senior Account Manager to manage all of those contractors that worked through my company. His job was to work with all of the VP’s of each division within IT. He would find out what projects they had ongoing, and what projects were coming up, and what skill sets they needed for each of those projects. 4. The Account Manager needed to know the skill sets of each contractor, so he could move the contractors, with the right skill sets, into the next project. 5. His only account was that Bank. 6. We also gave them a write-up on all of the work done by each contractor, and the rating they were given by their respective project managers on each job. 7. We also charged pretty close to same rate they were already paying each contractor. So what else was my company’s Value Proposition to this Bank? It turns out that the turnover of their contractors was about 50% a year. So they lost all existing contractors every two years. They were paying, at that time, about $50 per hour per contractor. And with 75 contractors they were losing over $7.5 million on contracting turnover costs alone. That cost didn’t include the costs of training new contractors, or replacing the knowledge of the people that had left. They estimated that cost doubled the replacement cost. So, they were losing over $15 million every two years by not managing their contractors properly. And since the senior executives of IT were paid on managing costs, this took a little chunk out of their paycheques. We showed them a better way to manage their contractors, without it costing much more money. And we helped them earn more money personally, by managing these people for them. And of course that $15 million dollars was now revenue for my firm. How’s that for a Value Proposition! Of course that is just one way to show value. Each market, and each business, is different. But if you put your mind to it, you too can come up with a Value Proposition that will interest your clients. Even in a commodity market. 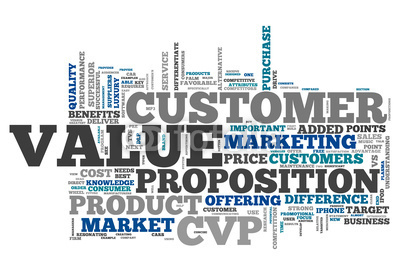 How are you doing with your company’s Value Proposition? Your company’s Value Proposition involves a number of factors. 1. You must know your own products and services and what benefits and value – these are different – they bring your clients. 2. You must know your marketplace and how your products and services fit. 3. You must understand the issues your clients and prospects face, and how your products and services help alleviate or eliminate them. 4. You must know your ideal clients and why they would want your products and services. 5. You must know what differentiates you from your competition. And in today’s times, it is often very difficult to know who your competitors are. Do you have a Powerful Value Proposition that shows your clients the real value you are bringing to them? Contact me, through my email below, and let me show you, FOR FREE, how you can deliver the right Value Proposition for your business. And how your Value Proposition can then deliver a lot more revenue, and profits, to your business. Why can’t B2B sales people sell – Part 2- Lack of Foundational Knowledge?